There are only a few options located in the Preferences, accessible though the menu via Edit > Preferences. Most other options, like whether to draw the grid, what kind snapping to do or the last used settings when creating a new map are simply remembered persistently. This option is not enabled by default, since it is of very little use whereas it can in some environments cause problems. Feel free to enable it if it helps with validation for example, but note that the referenced DTD is likely out of date (there is a somewhat more up-to-date XSD file available in the repository). This is very useful while working on the tiles or when the tiles might change as a result of a source control system. Generally a useful thing to keep enabled. This setting causes files to be written to a temporary file, and when all went well, to be swapped with the target file. This avoids data getting lost due to errors while saving or due to insufficient disk space. Unfortunately, it is known to cause issues when saving files to a Dropbox folder or a network drive, in which case it helps to disable this feature. The following export options are applied each time a map or tileset gets exported, without affecting the map or tileset itself. All tilesets are embedded in the exported map. Useful for example when you are exporting to JSON and loading an external tileset is not desired. All template instances are detached. Useful when you want to use the templates feature but can’t or don’t want to load the external template object files. Stores effective object type and properties with each object. Object properties are inherited from a tile (in case of a tile object) and from the default properties of their type. These options are also available as options when exporting using the command-line. By default the language tries to match that of the system, but if it picks the wrong one you can change it here. Because black is not always the best color for the grid. The tile grid can be divided further using this setting, which affects the “Snap to Fine Grid” setting in the View > Snapping menu. Shapes are by default rendered with a 2 pixel wide line, but some people like it thinner or even thicker. On some systems the DPI-based scaling will affect this setting as well. This enables a rather unoptimized way of rendering the map using OpenGL. It’s usually not an improvement and may lead to crashes, but in some scenarios it can make editing more responsive. This option causes the mouse wheel to zoom without the need to hold Control (or Command on macOS). It can be a convenient way to navigate the map, but it can also interfere with panning on a touchpad. 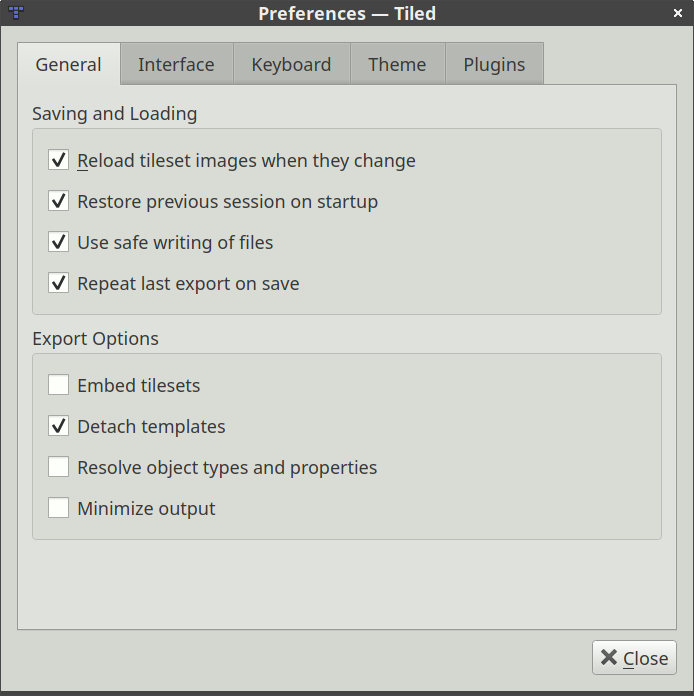 On Windows and Linux, the default style used by Tiled is “Tiled Fusion”. This is a customized version of the “Fusion” style that ships with Qt. On macOS, this style can also be used, but because it looks so out of place the default is “Native” there. The “Tiled Fusion” style allows customizing the base color. When choosing a dark base color, the text automatically switches to white and some other adjustments are made to keep things readable. You can also choose a custom selection color. The “Native” style tries to fit in with the operating system, and is available since it is in some cases preferable to the custom style. The base color and selection color can’t be changed when using this style, as they depend on the system. The official macOS builds and the Windows installers of Tiled ship with an automatic update check, done by Sparkle and WinSparkle respectively. These solutions also offer to download the new version and to upgrade or run the installer afterwards. You can turn off the update checks or trigger them manually using the Check Now button. Here you can choose which plugins are enabled. Currently plugins only serve to add support for additional map and/or tileset file formats. Some generic plugins are enabled by default, while more specific ones need to be manually enabled. There is no need to restart Tiled when enabling or disabling plugins. When a plugin fails to load, try hovering its icon to see if the tool tip displays a useful error message. See Export Formats for more information about supported file formats.